NORDSTROM (Upcoming) Estee Lauder Mother’s Day 2016: Haute Pink $37.50 with any Estée Lauder purchase. Over a $175 value. Full-size Gentle Eye Makeup Remover (3.4 oz.). This set is available now at Estee Lauder direct here. (NEW) Nordstrom offers brand new MAC Future collection. (NEW) Obsessive Compulsive Cosmetics is 10% off too. (1d) Nordstrom offers 10% off (price match) almost all beauty brands e.g., Dior, Yves Saint Laurant, Estee Lauder, Glamglow, Kiehl’s, Clinique, Anastasia, Laura Mercier, Shiseido, Clarins, Molton Brown, Philosophy, AHAVA, Clarisonic, NuFace and more. See all Nordstrom Price Matching page here. Bobbi Brown is 20% off. Lancome is also 10% off (Lancome beauty boxes also 10% off) + you can choose your FREE Gift with $39.50 Lancôme Purchase – a $130 value. Plus, spend $35.50 more for an additional Bonus Gift: two full-size Color Design Lipcolors in Inconspicuous and Out With A Bang and one deluxe sample of Blush Subtil Delicate Oil-Free Powder Blush in Aplum. A combined value up to $190! Use promo code REPAIR, LIFT or HYDRATE. See all GWPs here. Pick 3 free samples at checkout. All order ship free no minimum. You can see more promo codes at Nordstrom in my page here. Sephora (NEW) All Urban Decay x Gwen Stefani is on sale (except eyeshadow palette) – you will get an extra 10% – 15% off with coupons too. Sephora and Sephora.ca (NEW) Sephora Love Note Shopping Event 2016 : is live now for VIB Rouge and VIB. For Beauty Insider it will start tomorrow. VIB Rouge: use coupon code ROUGENOTE to get 15% off on 4/7 – 4/13. VIB: use coupon code VIBNOTE to get 15% off on 4/8 – 4/13. Beauty Insider: use coupon code BINOTE to get 10% off on 4/9 – 4/12. Macy’s (NEW) also offers Unban Decay x Gwen Stefani on sale + 2pc GWP ($50 minimum). Don’t forget coupon code CHANEL for free 2 deluxe size Chanel mascaras with any beauty purchase! (5d) Receive a FREE Mystery Gift with any $75 online Beauty purchase (have you received it? what’s in it, please share!). Free shipping all beauty no minimum. Adore Beauty Australia (NEW) Spend over $149 sitewide and choose from 1 of 2 Adore Beauty Discovery Kits. Use promo code: DISCOVER. See this page for all coupon codes. Free shipping on all Australian orders. Two free samples on any $50 order. Ship to US, Canada, UK starts from $6.95. Algenist (NEW) offers 50% off on select items use code APRFLASH, ends 4/14. Two free samples with every order. Free shipping with any $50 order. Amore Pacific (NEW) Free 5 samples with any order. With any $100 order receive MOISTURE BOUND Sleeping Recovery Masque (5ml) and with any $200 order receive ALL DAY BALANCING CARE SERUM (3ml). With Your Purchase of COLOR CONTROL CUSHION COMPACT, receive a free TREATMENT CLEANSING OIL (30ml); With Your Purchase of Any TIME RESPONSE Collection, receive a free TIME RESPONSE Hand Renewal Creme (10ml). See Clearance items here. Choose free sample and free shipping on any order. BareMinerals UK (NEW) Use code NEWBIE to get 10% off your first purchase. (3d) Receive a free Prime Time Foundation Primer Deluxe Sample on all orders. Use code PRIME at checkout. Offer ends at 23.59 on 30th April 2016. Get a FREE matching deluxe foundation sample with any foundation purchase. No offer coded needed. Free shipping on any £35 order. Barneys New York (NEW) offers new beauty 2016 collections. See all available GWPs here. Free shipping all orders no minimum. The Bay Canada (Hudson’s Bay) (NEW) (4/8- 4/14) Bay Days is back! Lowest prices of the season – Save up to 50% on top brands! (1d) Spring 2016 Gift with Purchase – Visionnaire Choice – Renergie Choice or Absolue Choice. See all gifts with purchase here. Always pick 3 free samples at checkout. BeautifiedYou (NEW) Use code OFF20 to get 20% off (may exclude beauty bags). 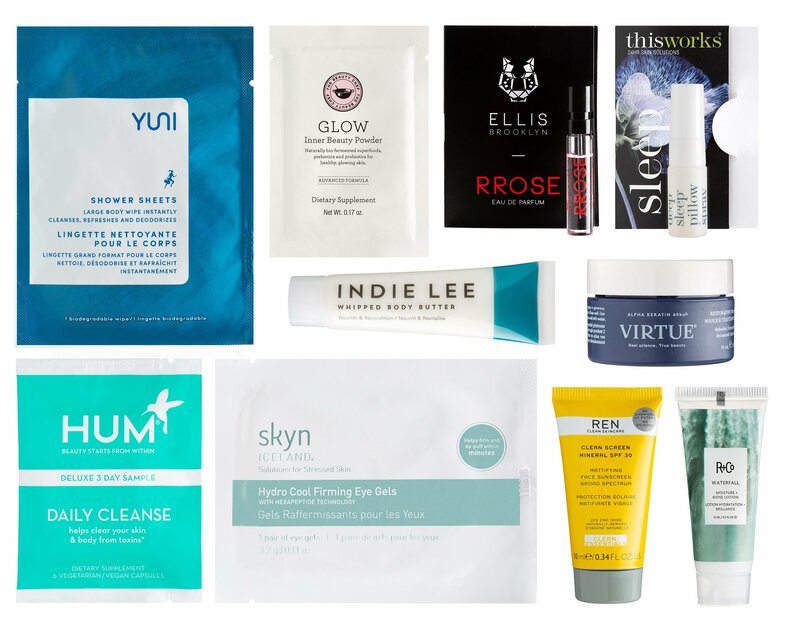 They offer six exclusive beauty bags from $5 – $15 ($50 value) and shipping is free (international shipping adds $10). Free skincare samples with purchase. Free shipping on any $25 order. Beauty.com (NEW) Buy a Nuface Toning Device and receive Erno Laszlo Duo ($96 Value). (3d) Use promo code BEAUTY15 to get $15 off $75 purchase (some brand exclusions apply), ends 8/27. (4d) Three new gifts (ends 4/9): Get a free Origins Earth Month Tote with $10 in-stock Beauty.com order. (4d) Get a free bareMinerals Pop of Passion Lip Oil-Balm, Pink Passion deluxe sample with your $20 in-stock makeup purchase. (4d) Get a free Pacifica Indian Coconut Nectar Body Butter deluxe sample with any Bath and Body purchase of $20 or more. All while supplies last and must click the banner to redeem. Always choose free 3 samples with qualified purchase and free shipping with any $35 purchase. Receive a free Milly Game Face sample-filled bag with any $125 order (a $150 value). See more GWP offers here. Bon Ton (4d) Lancôme Spring 2016 Makeup Beauty Box – Only $45 with any Lancôme purchase (A $219 Value). (NEW) They still have 3 free deluxe samples with your beauty and fragrance purchase of $75 or more; excludes a Lancôme and Origins purchase. Always, free shipping at Bon Ton on orders over $25 with code BEAUTY25. Carol’s Daughter (NEW) Enjoy up to 40% off select products and choose your free travel size gift, ends 4/11/16. No code needed. Free shipping with any $25 order, otherwise, shipping is $6.95. Clinique (NEW) Pick 4 free minis with your $40 order (no code needed) plus choose more free gift and a bag with any $65 order use code LIPS or BODY. (3d) All Mother’s Day 13 sets ship free! (2d) Clinique launched a new Clinique Acne + Line Correcting Serum (Salicylic Acid Acne Medication) Use code PINK to get free tote with your $55 order. You may pick your mini(s) with any order here. Free shipping on any $50 order. Clinique.ca (NEW) Free shipping no minimum, ends 4/30. (NEW) Pick 4 free minis with your $40 order (no code needed) plus choose more free gift and a bag with any $65 order use code LIPS or BODY. (4d) Use code PINK to get a free tote with any $55 purchase. Pick one free Clinique mini with any order here (must add to your cart). Free shipping on any $C50 order. Sign up for the newsletter and get 15% off. Cult Beauty UK (NEW) See Best of US beauty page here. (2d) FREE Deluxe Spackle Primer & Balance-n-Brighten Foundation when you spend £30 on Laura Geller, FREE Intensive Mask Sea Cucumber (25g) with every Blithe purchase, FREE Regenerating Cleanser 50ml when you spend £60 on Tata Harper and FREE Nature’s Living Superfood (20g) when you spend £20 on KIKI Health, ends 4/9. (6d) They offer free shipping on Anastasia Beverly Hills products, ends 4/30. (6d) 20% off Becca backlight primer and highlighter duo. With any £40 order, receive 2 free samples at checkout. Free worldwide shipping on any order over £50. Drugstore (NEW) Through 5/31, get a $15 rebate by mail (via Visa gift card) when you spend $50 across select P&G brands. Participating brands include: COVERGIRL, Pantene, Secret, Ivory, Herbal Essences Hair and Body Wash, Aussie, Clairol, Safeguard, Olay Skin, Olay Body, Head & Shoulders, Old Spice and Vidal Sassoon Color. Excludes trial/travel size. (2d) See new Wonder Woman collection here. (4d) They offer up to 60% off beauty items here. Free shipping on orders over $35. Estee Lauder (NEW) Just in today: Limited Edition Mother’s Day Haute Pink $37.50 WITH ANY PURCHASE, WORTH OVER $175. (NEW) Use code PERFECT16 to get 3pc gift with $50 order. (3d) Estee Lauder offers 15% Off One Online Order When Join Estee E-List Loyalty Program. One promo code per order. Free shipping with any $50 order. One free sample with any order. (4d) See monthly Sweepstakes here to win $350! First Aid Beauty (NEW) Use code FABULOUS15 to get 15% off your first purchase (except kit). (NEW) Free Slow Glow Self-tanning moisturizer with any $75 purchase. Free shipping on any $50 order. FragranceNet.com (NEW) Get an Extra 25% Off Mother’s Day Orders with code MDAYRK25. Ends 5.8.16 Refillable Perfume Travel Atomizer only $7.99 (a $15.99 value). Airline approved, patented refill system fills directly from almost any fragrance bottle. Free shipping on orders over $59. GLOSSYBOX (NEW) offers Mother’s Day Limited Edition box: To Mom with Love $40 (a $148 value). (NEW) Free Julep Gel Eyeliner The Color Of Smoky Taupe Shimmer As A First Time Subscriber Use code EYESHIMMER, ends 4/30. Kate Somerville (NEW) offers $48 value gift with any $15o purchase. Free shipping with any $50 order and 3 free samples with any order. LivingSocial (NEW) Take 10% off any purchase or 20% off $50+ with code APRILSAVINGS, ends 4/10 at 11:59pm PT. Restrictions apply. Macy’s (NEW) Extra 40% off Clearance, ends 4/10. (2d) 25% off Select Clearance styles at macys.com. Valid 4/6-4/9. Memebox (NEW) There are two new boxes (no sub) Festival Ready Skincare Box ($60 value) $25 and Festival Ready Makeup Box ($74 value) $30. Neiman Marcus Last Call (NEW) Take 40% off 1 item Use code: 40APRIL, ends 4/10. (2d) Take 30% off Women’s Shoes, Jewelry, and Handbags, ends 4/12. Free shipping on orders of $99 with coupon code LCSHIP or choose free in-store pick up. Paula’s Choice (NEW) Free Trial Size Serum on $50+, ends 4/10. (3d) Mother’s Day Sale – Get her the best skincare products, ends 5/31. (3d) 30% Off Skin Balancing Anti-Aging Serum with Retinol, ends 4/10. Free Shipping on $50 order and choose 3 free samples with any $5 order. Peter Thomas Roth (NEW) offers 25% off all cleanser, ends 4/13. See travel size shop here (starting from $3). Check out Special offer page where you can get new great sets at deep discount. Puritan’s Pride (NEW) Freebie Friday! Free Lemongrass Essential Oil with any $10 Purchase use Code: LEMONGR. Ends 4/8 11:59 PM PST. (1d) Warehouse Sale! Extra 50% Off already discounted items. Total Discount up to 75% Off! See Details. Ends 4/20 11:59 PM PST. Free shipping on any $19.95 order, otherwise $4.95. So browse around and grab a few things to save $4.95! (2d) Buy 2 Get 3 Free Puritan’s Pride brand No Code Necessary. Ends 4/20. – Over 100 Clearance Items up to 73% Off. – Shop Health & Beauty! Buy 2 Get 3 FREE. – Essentials for Moms, Babies, and Children Products! Up to 50% Off. Saks Fifth Avenue OFF 5TH (NEW) Through 4/11, Take an EXTRA 15% OFF Select Styles Use Code EXTRA15. (2d)(HOT) Through 4/13, FREE SHIPPING ON ALL ORDERS no minimum. Use code FREE4YOU. Sally Beauty (NEW) Through 4/30, receive a FREE Spring Tote Bag with any $49+ online purchase. Free shipping on orders over $50 and ships to Canada. Sanrio (NEW) Free Erasable Egg Crayon Set With $50 Purchase, Enter Code EGGCRAYON. (NEW) Free Tote Bag With $60 Purchase, Enter Code GIRLSDAY. (NEW) Free Mini Music Box With $25 Purchase, Enter Code MUSICBOX. Smashbox Cosmetics (NEW) Through 4/10, free 2 Deluxe Samples with any $40 Purchase with coupon code COLORCORRECT. Plus, free shipping and samples on all US orders. Sign up and get 15% off your first order. Stowaway Cosmetics (NEW) Through 4/30, Get 20% Off Orders Over $100 Free shipping on any $25 order. Walmart (NEW) Shop Gifts for Mom here. Shop Value Bundles for Babies and Toddlers here. Free shipping on any $35 order. Zulily (NEW) Through 4/10, Up to 55% Off Elizabeth Arden & CLARINS Skincare. Free shipping all orders with Visa checkout. Shipping starts from $5.95. IcanGWP site contains affiliate links. Purchasing through these links help support the site and make it possible for IcanGWP to bring you all these sweet offers. Thank you.